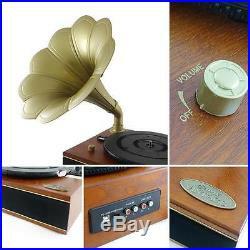 Vintage Classic Style Bluetooth Turntable Gramophone Phonograph Vinyl Record Player with Vinyl-to-MP3 Recording. The Pyle PNGTT turntable system combines yesterday’s classic record playing gramophone style with todayâs latest technology. Built-in Bluetooth and full range stereo speakers allow you to wirelessly stream music from devices like iPhones Androids Smartphones iPads Tablets etc. The system is equipped with an elegant gramophone phonograph horn which can turn the unit into the center-piece to any room! The unique Vinyl-to-MP3 recording function gives you the ability to save all of your old vinyl records into digital MP3 files. You can quickly and easily transfer your music files onto your computer to share with family and friends! Turn that stack of old records into a space-saving compact digital music library. Listen to all of your records thanks to the (2) speed selectable vinyl playback modes (33 and 45 RPMs). 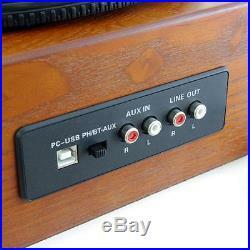 Use the rear panel RCA input and output jacks to connect even more external devices and fill your room with rich sound and Pyle Vintage style! Enjoy the classic and iconic design along with today’s latest hi-tech features with the Pyle PNGTT Bluetooth Gramophone Turntable System. Built-in Bluetooth for Wireless Music Streaming. Works with All of Your Favorite Devices. IPhone Android Smartphone iPad Tablet etc. Stream your Audio through the Turntable’s Speaker System Computer Recording Ability. Turns Your Vinyl Records into Compact Digital Audio Files. Save and Share Your Music. Easy Transfer to Mac or PC. Quick & Easy Digital Audio File Creation. Includes Audio Software and USB Connection Cable Features. Classic Style with Modern Technology. Computer Record & Connect Ability. Play it All: (2) Speed Turntable: 33 1/3 and 45 RPM. Auto-Return Vinyl Record Function. Tone Arm Automatically Resets Once Record Has Played. Auto-Stop Vinyl Record Function. Turntable Motor Powers-Off Once Record Has Played. Full Range Stereo Speaker System. Dual Built-in Mid-Range & Treble Speakers. RCA (L/R) Aux Input Connector Jacks. Ability to Connect External Devices. RCA (L/R) Aux Output Connector Jacks. Ability to Connect to External Speaker Systems. Works with Mac and PC. Includes Audacityâ¢ Music Editing Software Technical Specs. Bluetooth Version: 3.0. Bluetooth Wireless Range: 30’+ Feet. 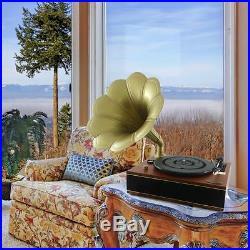 Includes 45RPM Vinyl Record Adapter. Power: AC 120V 60Hz. Dimensions (L x W x H): 16.3” x 12.2” x 19.6” with Horn. The item “NEW Pyle PNGTT12RBT Vintage Bluetooth Turntable Gramophone Vinyl Record Player” is in sale since Monday, October 12, 2015. This item is in the category “Consumer Electronics\TV, Video & Home Audio\Home Audio Stereos, Components\Record Players/Home Turntables”. The seller is “qualitycaraudio” and is located in Mountainville, New York. This item can be shipped to United States, Canada, United Kingdom, Denmark, Romania, Slovakia, Bulgaria, Czech republic, Finland, Hungary, Latvia, Lithuania, Malta, Estonia, Australia, Greece, Portugal, Cyprus, Slovenia, Japan, China, Sweden, South Korea, Indonesia, Taiwan, South africa, Thailand, Belgium, France, Hong Kong, Ireland, Netherlands, Poland, Spain, Italy, Germany, Austria, Russian federation, Israel, Mexico, New Zealand, Philippines, Singapore, Switzerland, Saudi arabia, Ukraine, United arab emirates, Qatar, Kuwait, Bahrain, Croatia, Malaysia, Brazil, Chile, Colombia, Costa rica, Dominican republic, Panama, Trinidad and tobago, Guatemala, El salvador, Honduras, Jamaica. Vintage Classic Style Bluetooth Turntable Gramophone Phonograph Vinyl Record Player with Vinyl-to-MP3 Recording. Built-in Bluetooth for Wireless Music Streaming. Works with All of Your Favorite Devices. IPhone, Android, Smartphone, iPad, Tablet, etc. Stream your Audio through the Turntable’s Speaker System Computer Recording Ability. Turns Your Vinyl Records into Compact Digital Audio Files. Save and Share Your Music. Easy Transfer to Mac or PC. Quick & Easy Digital Audio File Creation. Includes Audio Software and USB Connection Cable Features. Classic Style with Modern Technology. Computer Record & Connect Ability. Play it All: (2) Speed Turntable: 33 1/3 and 45 RPM. Auto-Return Vinyl Record Function. Tone Arm Automatically Resets Once Record Has Played. Auto-Stop Vinyl Record Function. Turntable Motor Powers-Off Once Record Has Played. Full Range Stereo Speaker System. Dual Built-in Mid-Range & Treble Speakers. RCA (L/R) Aux Input Connector Jacks. Ability to Connect External Devices. RCA (L/R) Aux Output Connector Jacks. Ability to Connect to External Speaker Systems. Works with Mac and PC. Includes Audacity Music Editing Software Technical Specs. Bluetooth Version: 3.0. Bluetooth Wireless Range: 30’+ Feet. 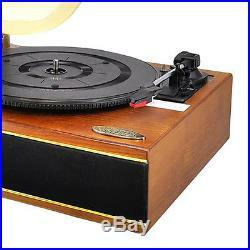 Includes 45RPM Vinyl Record Adapter. Power: AC 120V, 60Hz. Dimensions (L x W x H): 16.3” x 12.2” x 19.6” with Horn. The Pyle PNGTT turntable system combines yesterday’s classic record playing gramophone style with todays latest technology. Built-in Bluetooth and full range stereo speakers allow you to wirelessly stream music from devices like iPhones, Androids, Smartphones, iPads, Tablets, etc. The system is equipped with an elegant gramophone phonograph horn which can turn the unit into the center-piece to any room! The unique Vinyl-to-MP3 recording function gives you the ability to save all of your old vinyl records into digital MP3 files. You can quickly and easily transfer your music files onto your computer to share with family and friends! Turn that stack of old records into a space-saving compact digital music library. Listen to all of your records thanks to the (2) speed selectable vinyl playback modes (33 and 45 RPMs). Use the rear panel RCA input and output jacks to connect even more external devices and fill your room with rich sound and Pyle Vintage style! Enjoy the classic and iconic design along with today’s latest hi-tech features with the Pyle PNGTT Bluetooth Gramophone Turntable System. We currently only accept these types of payments. Hours: Monday through Thursday 10:00 a. To 5:00 p. Friday Saturday & Sunday closed. The free listing tool. The item “NEW Pyle PNGTT12RBT Vintage Bluetooth Turntable Gramophone Vinyl Record Player” is in sale since Wednesday, December 23, 2015. This item is in the category “Consumer Electronics\TV, Video & Home Audio\Home Audio Stereos, Components\Record Players/Home Turntables”. The seller is “exclusivecharms” and is located in Middletown, New York. This item can be shipped to United States, Canada, United Kingdom, Denmark, Romania, Slovakia, Bulgaria, Czech republic, Finland, Hungary, Latvia, Lithuania, Malta, Estonia, Australia, Greece, Portugal, Cyprus, Slovenia, Japan, China, Sweden, South Korea, Indonesia, Taiwan, South africa, Thailand, Belgium, France, Hong Kong, Ireland, Netherlands, Poland, Spain, Italy, Germany, Austria, Russian federation, Israel, Mexico, New Zealand, Philippines, Singapore, Switzerland, Saudi arabia, Ukraine, United arab emirates, Qatar, Kuwait, Bahrain, Croatia, Malaysia, Brazil, Chile, Colombia, Costa rica, Dominican republic, Panama, Trinidad and tobago, Guatemala, El salvador, Honduras, Jamaica. 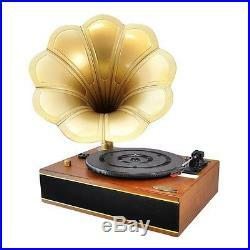 Bluetooth Turntable Gramophon Phonograph Vinyl Record Player. The Pyle PNGTT turntable system combines yesterday’s classic record playing gramophone style with todays latest technology. Built-in Bluetooth and full range stereo speakers allow you to wirelessly stream music from devices like iPhones, Androids, Smartphones, iPads, Tablets, etc. The system is equipped with an elegant gramophone phonograph horn which can turn the unit into the center-piece to any room! The unique Vinyl-to-MP3 recording function gives you the ability to save all of your old vinyl records into digital MP3 files. You can quickly and easily transfer your music files onto your computer to share with family and friends! Turn that stack of old records into a space-saving compact digital music library. Listen to all of your records thanks to the (2) speed selectable vinyl playback modes (33 and 45 RPMs). Use the rear panel RCA input and output jacks to connect even more external devices and fill your room with rich sound and Pyle Vintage style! Enjoy the classic and iconic design along with today’s latest hi-tech features with the Pyle PNGTT Bluetooth Gramophone Turntable System. Bluetooth Connectivity: Built-in Bluetooth for Wireless Music Streaming. Computer Recording Ability: Turns Your Vinyl Records into Compact Digital Audio Files Save and Share Your Music, Easy Transfer to Mac or PC Quick & Easy Digital Audio File Creation Includes Audio Software and USB Connection Cable. Features: Classic Style with Modern Technology Computer Record & Connect Ability Play it All: (2) Speed Turntable: 33 1/3 and 45 RPM Auto-Return Vinyl Record Function Tone Arm Automatically Resets Once Record Has Played Auto-Stop Vinyl Record Function Turntable Motor Powers-Off Once Record Has Played Full Range Stereo Speaker System Dual Built-in Mid-Range & Treble Speakers RCA (L/R) Aux Input Connector Jacks RCA (L/R) Aux Output Connector Jacks Ability to Connect to External Speaker Systems Works with Mac and PC Includes Audacity Music Editing Software. Technical Specs: Bluetooth Version: 3.0 Bluetooth Wireless Range: 30’+ Feet Ceramic Cartridge Belt-Drive System Includes 45RPM Vinyl Record Adapter Power: AC 120V, 60Hz Dimensions (L x W x H): 16.3” x 12.2” x 19.6” with Horn. Thank you for shopping with Deal-Buys. We strive to have the best customer service possible so be ensured you will be happy purchasing with us! We will try and respond to all questions or concerns in a timely fashion even after office hours! See our other items. The item “New Pyle PNGTT12RBT Bluetooth Turntable Gramophon Phonograph Vinyl Record Player” is in sale since Thursday, October 08, 2015. This item is in the category “Consumer Electronics\TV, Video & Home Audio\Home Audio Stereos, Components\Record Players/Home Turntables”. The seller is “deal-buys” and is located in United States. This item can be shipped to United States, Canada, United Kingdom, Denmark, Romania, Slovakia, Bulgaria, Czech republic, Finland, Hungary, Latvia, Lithuania, Malta, Estonia, Australia, Greece, Portugal, Cyprus, Slovenia, Japan, China, Sweden, South Korea, Indonesia, Taiwan, South africa, Thailand, Belgium, France, Hong Kong, Ireland, Netherlands, Poland, Spain, Italy, Germany, Austria, Russian federation, Israel, Mexico, New Zealand, Philippines, Singapore, Switzerland, Saudi arabia, Ukraine, United arab emirates, Qatar, Kuwait, Bahrain, Croatia, Malaysia, Brazil, Chile, Colombia, Costa rica, Dominican republic, Panama, Trinidad and tobago, Guatemala, El salvador, Honduras, Jamaica.